Biography of Victorian Romantic Painter of Lady of Shalott. 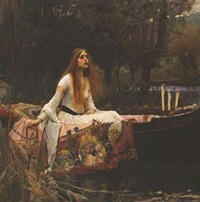 Best known as the creator of The Lady of Shalott, one of England's great masterpieces of Romanticism, John William Waterhouse started painting in a manner close to Lawrence Alma-Tadema (1836-1912) and Frederic Leighton (1830-96), depicting classical and historical scenes, but then turned to the depiction of literary themes executed in a dreamy, romantic manner. Although influenced by the Pre-Raphaelites, his sensuous handling of paint gave his works a unique identity. As a youth, Waterhouse worked in his father's studio developing a talent for sculpture and painting, before he later attended the Royal Academy schools. His early classical themes were exhibited at the Royal Academy and the Society of British Artists. His later works can be classified as either Pre-Raphaelite or Neoclassical. He became financially successful and renowned during his lifetime, and prints of his works were widely popular among the middle classes. Famous examples of his pre-Raphaelite style of realist painting include Lady of Shalott (1888, Tate London) and Hylas and the Nymphs (1896, Manchester City Art Gallery). Towneley Hall Art Gallery, Burnley. Very little is known of Waterhouse's private life, as few of his letters have survived. Although born in Rome, where his father was working as an artist, within a few years he returned to England where his father set up a studio. Waterhouse assisted him, and thus absorbed the basic techniques of watercolour, oil painting and sculpture at an early age. In 1870 he entered the Royal Academy school to train as an artist. In 1872 he exhibited with the British Artists and from 1874 with the Royal Academy. His first paintings were mainly classical and historical themes, revealing the influence of Alma-Tadema, one of the most eminent classical painters of late 19th century England. Waterhouse was also influenced by Frederic Leighton, a sculptor and painter who painted classical, historical and biblical subjects. 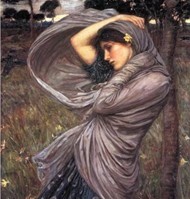 Often associated with the Pre-Raphaelites, Waterhouse was born the year after they first exhibited at the Royal Academy. It wasn't until the 1880s, that he came under the influence of the movement, which had revived literary themes in paintings. He inherited their taste for the myths of enchantresses, as well as the works of John Keats, William Shakespeare and Alfred Tennyson. The Pre-Raphaelite Brotherhood originally came together in opposition to the Royal Academy's promotion of Renaissance master Raphael (1483-1520) as the ideal artist of all time. They also rebelled against what they considered the triviality of genre painting, which was immensely popular in the mid-1800s. The themes they preferred were initially religious, then later literary: notably themes of love and death. The founding members of the group were William Holman Hunt (1827-1910), John Everett Millais (1829-96) and Dante Gabriel Rossetti (1828-82). Later they were joined by Ford Madox Brown (1821-93), Frederic George Stephens (1828-1907), James Collinson (1825-81) and Thomas Woolner (1825-92) and Edward Burne-Jones (1833-1898). In fact, they represented one of the first movements of avant-garde art, although they have been denied this status because of their support for traditional concepts of mimesis (imitation of nature) and history painting. The movement was mainly inspired by Romanticism, although they were later to be divided over the argument of Realism versus Idealism. The Pre-Raphaelites were to influence many other artists including Gustave Moreau (1826-98). Waterhouse found Pre-Raphaelite subject matter quite agreeable, being especially fond of the femme fatale genre within Romantic settings. However, his painting technique differed considerably from the rest of the group. His fondness for blocks of colour and broad chunky brushstrokes were derived from French Realist painter Jules Bastien-Lepage (1848-84). It was a style introduced to him by Stanhope Forbes (1857-1947) and other painters from the Newlyn School, based in St Ives in Cornwall. Waterhouse's famous masterpiece The Lady of Shalott (1888) is an illustration of Alfred Tennyson's poem the Lady of Shalott from Camelot. She sits in a boat, staring at 3 candles which symbolize life. Two have gone out, indicating her life will soon end. Alongside John Everett Millais' painting of Ophelia (1851, Tate), The Lady of Shalott is one of the most commonly reproduced posters of Pre-Raphaelite art, and is a strong candidate for the title of England's favourite painting. Waterhouse's mythological painting Hylas and the Nymphs (1896) is also a wonderful piece of art: a mythical scene showing Hylas being tempted to his death by river nymphs. Another English painter whose works - like those of Waterhouse - caught the mood of Victorian England was the popular animal artist Sir Edwin Landseer (1802-73), best-known for his anthropomorphic paintings and prints of dogs. 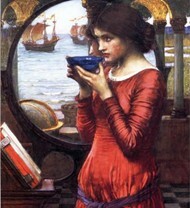 Waterhouse was elected an associate of the Royal Academy of Arts in London in 1885 and became a full member in 1895. By the mid-1880s he was exhibiting at several galleries throughout the country, including London's Grosvenor Gallery and New Gallery. This brought a certain amount of financial success. By the 1880s he began exhibiting portrait paintings, as commissions increased due to his rising reputation. In 1901 he joined the St John's Wood Arts Club, which included the highly versatile artist George Clausen (1852-1944) and Alma-Tadema. He also served on an advisory council, advising up and coming artists such as the Indian-born British painter and designer Byam Shaw (1872-1919). Despite suffering from illness in the last decade of his life, Waterhouse continued painting until his death in 1917. Today, his paintings are housed in some of the best art museums around the world, including those in England, America, Canada and Australia. In 2009 the Royal Academy of Arts hosted the largest ever retrospective of his works, entitled J.W. Waterhouse: Garden of Enchantment. This was the first exhibition ever to feature works from his entire career. The exhibition moved to the Montreal Museum of Fine Arts in 2010.  For more biographies of important modern artists, see: Famous Painters.